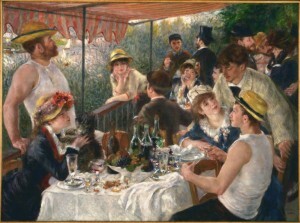 Pierre-Auguste Renoir, Luncheon of the Boating Party, between 1880 and 1881. Oil on canvas, 51 1/4 x 69 1/8 in. Acquired 1923. The Phillips Collection, Washington D.C.
We’re Out of Paint, So . . .
Let’s paint a picture with our food. For red we’ll squeeze these cherries. For purple let’s splash grape juice on. For blue we’ll use blueberries. For black just use some licorice. For brown pour on some gravy. In the egg yolk you just gave me. To stop . . . and see . . . and munch on. How do you think this poem relates to Luncheon of the Boating Party? Choose a color that strikes you in the painting. Imagine you are out of paint. What food would you use to paint your chosen color and why? Share your choice in the comments! This entry was posted in Experiment Station and tagged education, jazz and families fun days, luncheon of the boating party, permanent collection, poetry, renoir. Bookmark the permalink.